Thousands of Orthodox believers came to the St. Vladimir Cathedral overlooking the ruins of the ancient Greek town of Khersones near the Black Sea port of Sevastopol on Sunday to attend a liturgy led by Patriarch of Moscow and All Russia Kirill. Khersones is a sacred place for Russia. Legend has it that St. Prince Vladimir, who converted Kievan Rus to Christianity, got baptized there according to a Byzantine ritual. St. Cyril, the equal-to-the-Apostle Greek enlightener from Macedonia and the heavenly patron of Patriarch Kirill, once came to Khersones on a missionary visit and delivered a sermon which, in the patriarch’s opinion, determined the Orthodox future of Kievan Rus. After that sermon, Prince Ascold, the then ruler of Kyiv, adopted Christianity. That happened nearly 120 years before Prince Vladimir got christened. It’s here, in Crimea, that Russian Orthodoxy made its first steps. That alone turns Crimea into a spiritual center for all our people. It’s important for people to understand that apart from being a place for beach rest and holiday-making, Crimea is also a place for pilgrimage. I pray that the rebirth of faith among our people will boost pilgrimage to Crimea, to the roots of Orthodoxy. Reflected in this church as in a drop of water is the entire modern history of our fatherland – glory, downfall and recovery. Today, we should learn to understand the symbols and mysterious signs that God sends us. We should learn to hear God’s voice and distinguish His will in those mysterious signs. I pray that this bright and vivid symbol of rebirth – the Cathedral of St. Prince Alexander Nevsky – will teach us many things and will give all of us rebirth and hope. 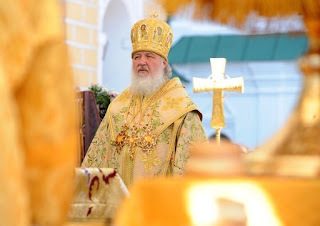 From Crimea, Patriarch Kirill will go to western Ukraine.